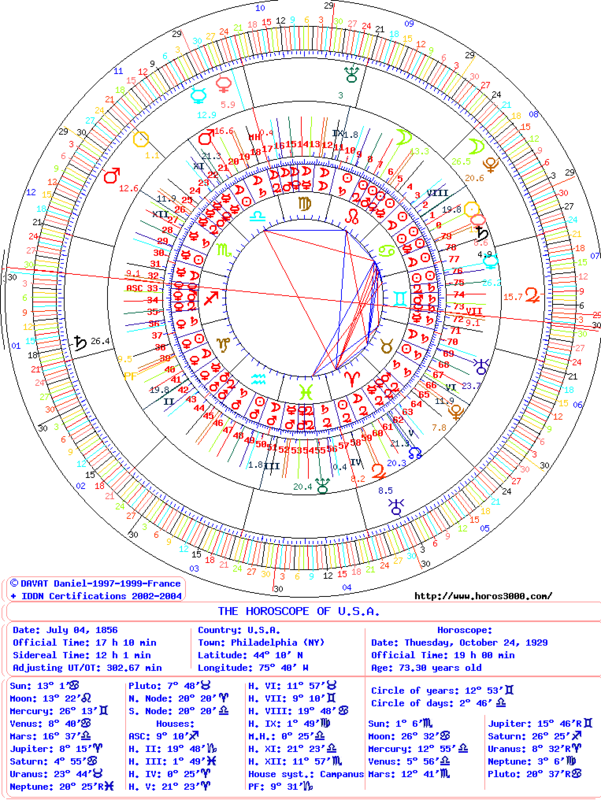 For world astrology, I use the birth chart of the Declaration of Independence of July 04, 1776 with 17h10 of the United States. The dating of the 360° of the zodiac is done for a duration of 80 years. The charts are created for the years 1776, 1856 and 1936. The stock exchange crash of Wall Street occurred between on October 24, 1929 (black Thursday) and on October 29 (black Tuesday). It causes the Great depression, the greatest economic crisis of the 20th Century. It is the system of installment purchase of actions, authorized since 1926, which is the cause. Indeed, the investors were allowed to buy the titles with only 10% of financial cover. Transits Jupiter has a transit in House VII in Gemini. The Sun is determining of this crash of Wall Street of 1929. It has a very powerful force as point of convergence on the degrees of the years (11° et 12° of Gemini). It has a middle quality. It is governor of the House V, that of the speculation. Mars, as master of the period, has a very evil quality in Libra, one of its signs of Detriment. It has a powerful force. It is govornor of the House II, that of money and also of the House V (with Sun). All the data of the year announced a major problem (Sun has a very powerful force and middle quality) concerning the financial sphere (Houses II and V cited). In addition, Saturn is the governor of Part of Fortune. It has a very evil quality (in Cancer) and a powerful force united with the natal Sun. This conjunction of Sun (governor of the House V) with Saturn (governor of the Part of Fortune with very evil quality) made Sun and Saturn the astrological symbols of great American bankruptcies (to 1856 from 1936). It is like their second natures. With such a configuration, it is not astonishing that the speculators were allowed to obtain conditions to ruin all the American economy! There is still another very interesting analogy. This crash took place during the period Saturn/Mars, that of the two unlucky planets! With these two planets, Houses II, V and the Part of Fortune are reached by theirs very evil qualities. 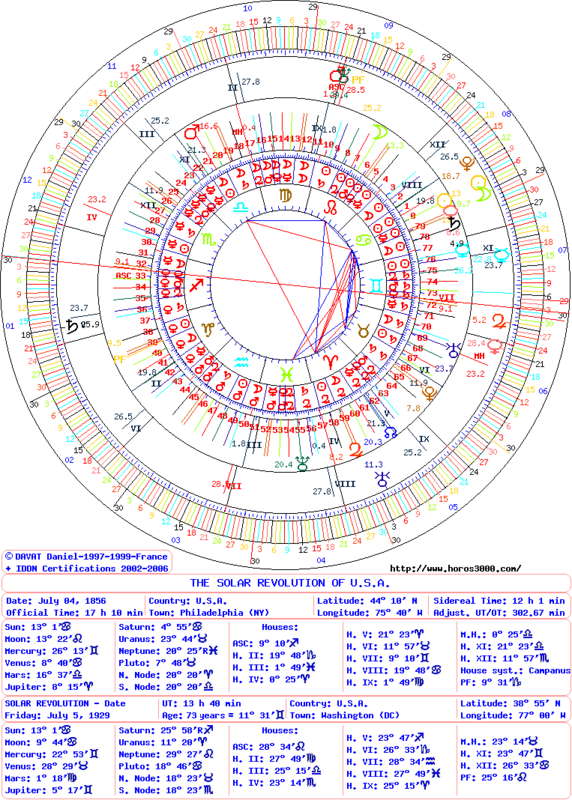 In the two charts, October 24, 1929 positions on Midheaven, the most powerful angle! This entry was posted on Thursday, July 26th, 2012 at 9:34 amand is filed under Finances. Both comments and pings are currently closed. Copyright © 1997-2019 - All rights reserved for all countries. Each post has an IDDN certification (Inter Deposit Digital Number).